Superbike World Championship (also known as SBK) is the worldwide Superbike racing Championship. The championship was founded in 1988. The Superbike World Championship season consists of a series of rounds held on permanent racing facilities. Each round has two races and the results of each race are combined to determine two annual World Championships, one for riders and one for manufacturers. The motorcycles raced in the championship are tuned versions of motorcycles available for sale to the public, by contrast with MotoGP where purpose built machines are used. MotoGP is the motorcycle world's equivalent of Formula 1 racing, whereas Superbike racing is similar to Touring Car racing. Europe is Superbike World Championship's traditional centre and leading market. However, rounds are also held in Qatar, Australia, South Africa, and the United States (in 2008}, for the first time since 2004). An Indonesian race was also proposed for the 2008 season, but this was later canceled by the FIM. The championship is regulated by the FIM the governing body of motorcycle racing and managed and promoted by FGSport. The Superbike World Championship began in 1988, being open to modified versions of road bike models available to the public. For many years, the formula allowed for machines with 1000 cc V-twin engines (principally Ducati, but later Aprilia and Honda) to go up against the 750 cc four-cylinder engines (Honda, Yamaha, Kawasaki and Suzuki). For the first few seasons Honda won with the RC30, but gradually the twins got the upper hand. Using 1000 cc V-twin engines benefited Ducati and it was able to dominate the championship for many years. From 1993 to 1999 Carl Fogarty and Ducati dominated, Fogarty won the title a record 4 times and finished as runner-up twice on factory Ducatis. Troy Corser also won the 1996 title and finished as runner-up in 1995, both times on a Ducati. Realizing that 1000 cc V-twin engines suited the superbike racing formula more, Honda introduced its own V-Twin powered motorcycle the VTR1000/RC51 in 2000. The result was clear right away as Colin Edwards won the championship in the bike's first year of competition. Ducati regained the title in 2001 with Troy Bayliss. Colin Edwards won his 2nd championship in what was arguably the most impressive comeback in the history of motorcycle racing. The season started with Troy Bayliss winning the first 6 races and by the end of race 1 at Laguna Seca he had 14 wins and was leading the championship by 58 points. Race 2 at Laguna Seca was the start of Colin Edwards' comeback, he went on to win all 9 remaining races and (aided by a race 2 crash for Bayliss at Assen) Edwards won the championship at the final race of the season at Imola. The final race of the season saw both riders fighting wheel to wheel for the entire race. The race is known by fans as the "Showdown at Imola". The manufacturer's championship was won by Ducati. During these years the Superbike World Championship reached the zenith of its popularity, with global fan and full factory support. In 2003 the FIM changed the rules to allow 1000 cc machines (either twins, triples or four-cylinder) to race. Rule changes in MotoGP to allow 4-stroke engines meant that the Japanese manufacturers focused their resources there, leaving the Superbike World Championship with limited factory involvement (only Ducati and Suzuki). 2003 also saw the entry of Carl Fogarty’s Foggy Petronas FP1. The bike was developed under the previous regulations and was powered by a 3 cylinder 900cc engine. With most of the field running Ducati motorcycles, the championship received the derogatory title "the Ducati Cup". The factory Ducati Team entered the only 2 Ducati 999's in the field, taking 20 wins from 24 races in a season where all races were won by Ducati. Neil Hodgson won the title on a factory Ducati. In an effort to create a more competitive field in 2004 organizers announced a series of changes to the championship. The most significant was that from 2004 the teams have had to run on Pirelli control or 'spec' tires. The decision to award the control tire to Pirelli was controversial. The Pirelli tires were considered to be below the standard of Dunlop and Michelin that most of the teams had been using. Dunlop looked to take legal action against the decision while Pirelli claimed that Michelin and Dunlop were also asked if they would be interested in the one-make tire rule contract. Partly as a result of the control tires, Motorcycle Sports Manufacturer Association (Aprilia, Ducati, Honda, Kawasaki, Suzuki and Yamaha) announced that no MSMA teams would participate in the Superbike World Championship, later modifying their statement allowing Ducati to participate. A few privateers chose to run Japanese bikes in 2004. Ten Kate Honda with Chris Vermuelen as its rider, won races and actually contended for the title that eventually was won by James Toseland and Ducati. Following Ten Kate Honda's success Japanese motorcycles made him a return in 2005 with major teams from all four Japanese manufacturers run through teams ran by European importers. 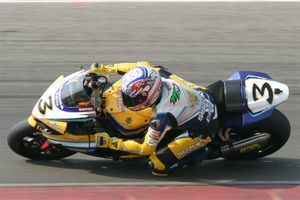 Troy Corser won the 2005 championship, giving Suzuki its first Superbike World Championship title. 2006 saw the return of Australian Troy Bayliss to the Superbike World Championship after three years in MotoGP. The combination of Bayliss and Ducati proved unstoppable and they dominated the season, winning 12 races. Honda-mounted James Toseland and Yamaha's Noriyuki Haga battled for second with the British rider coming out on top. Defending champion Troy Corser on a Suzuki was fourth. 2006 gave the feeling that the Superbike World Championship was 'back' following the years of decline in 2003 and 2004. Max Biaggi riding his Alstare Suzuki GSX-R1000 K7 at Assen. With MotoGP machines reduced in capacity from 990 cc to an 800 cc maximum displacement, 1000 cc Superbikes, both at World Championship and top national championships (AMA Superbike and British Superbike) become the most powerful racing bikes being road raced in 2007. While superbikes remained two or more seconds per lap slower than MotoGP bikes at most tracks where both raced, they had equal or more power. Troy Bayliss attempted to defend his title, riding once again a Ducati 999. Though 999 production ended in 2006 and the bike was replaced by the Ducati 1098, Ducati produced 150 limited-edition 999s at an elevated race specification to satisfy homologation requirements. Bayliss' main rivals in his title defense included former MotoGP rider Max Biaggi riding a Suzuki, 2004 champion James Toseland riding a Honda and Noriyuki Haga riding a Yamaha. The combination of some uneventful races in MotoGP and some thrilling races in SBK saw the championship's popularity increase even more. The championship was won by James Toseland in the season's last race. His 415 points put him two points ahead of Noriyuki Haga, with former MotoGP winner Max Biaggi following with 397 points on a Suzuki. After introducing the Ducati 1098 in 2007 powered by a 1099 cc v-twin engine Ducati requested that Superbike rules be changed to allow v-twins of up to 1200 cc compete against 1000 cc four-cylinder bikes. Ducati argued that they no longer produced a road-going 1000 cc V-twin superbike and that the level of tuning now needed to make their 999 competitive on the race track was too expensive. Ducati said they would quit if the rules were not changed, while Alstare Suzuki team boss Francis Batta also said that his team would quit if the new rules gave Ducati an unfair advantage. The FIM eventually included the 1200 cc displacement limit for twins in the 2008 superbike rules. According to the new rules, twin-cylinder motorcycles would be 6 kg heavier than four-cylinder machines (168 kg to 162 kg) and would also have a 50 mm air restrictor fitted. The weight limit and the intake-restrictor size of twin machines would be updated, if needed, during the Championship, by a system analysing the race points obtained. The new rules also changed the minimum number of bikes required to acquire homologation. For 2008 and 2009, all manufacturers, regardless of total production numbers, had to produce a minimum of 1,000 bikes to acquire homologation. From 2010 onwards, the minimum production number was increased to 3000 bikes. In the past, smaller manufacturers were allowed to build as few as 150 bikes to meet the homologation requirements. Manufacturers took advantage of this by producing 'homologation specials'--highly tuned versions of their road bikes with performance parts designed especially for racing. 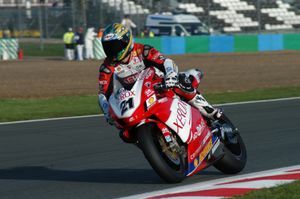 The 2008 SBK championship was dominated by Troy Bayliss of Australia, on his Ducati 1098, who concluded his season and his career with a double win at the brand new, 195-million-Euro Portimao circuit in Portugal, after which he retired. During the offseason, Yamaha lost its main rider Noriyuki Haga to Ducati, which hired him to replace the retired Bayliss. His place was taken by 3-times AMA champion Ben Spies, who was expected to give Haga serious competition. In the first half of the season, Haga pulled off a fast start, winning six races; Ben Spies won five, but reliability problems of his Yamaha and some mistake put him 87 points behind the Japanese. Despite being in control, Haga lost nearly all of his advantage after a couple of falls in Donington and at the Nurburgring (the one in Donington causing him a fractured ulna of the right arm), and the championship went down to the last race of the last round at Portimao. Haga was leading the series by 10 points going into the final round, and Spies needed to win both races (he would have won the Championship based on most wins). In race 1, Haga fell while Spies cruised to a victory, thus allowing him to go into the last race of the season with a 15 point lead. He rode to a fifth place finish, while Haga placed second (passing Rea in the last corner of the race). Spies won the World Championship by a mere 6 points. Ben Spies took a record 11 poles in the 14 round series and 14 wins (17 podiums) in 28 races; his main rival Haga was more consistent, finishing on the podium 19 times but winning only 8 races. 2009 also saw the debut of two new constructors, Aprilia and BMW. Aprilia took a fourth final place in the championship with Max Biaggi, while BMW finished thirteenth with Troy Corser. 2009 Champion Ben Spies moved to MotoGP. James Toseland returned to the championship after 2 seasons in MotoGP and took Spies place at the Sterilgarda Yamaha World Superbike team, partnered by fellow Brit Cal Crutchlow. The factory Ducati team retained their two riders. The 2010 season started on February 28 at Phillip Island and is scheduled to end on October 3 at Magny-Cours. Riders from all over the world compete in the Superbike World Championship. The championship is perhaps most closely followed in Italy because of Ducati and the United Kingdom where superbike racing has been the most popular form of motorcycle racing. 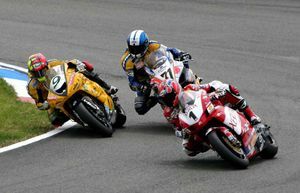 National-championship superbike racing is conducted in several countries, including the United States, the U.K. and Japan. Riders from Australia and the United States have traditionally been successful in the world championship. No American rider had won a race since Colin Edwards won the 2002 championship until Ben Spies joined the series in 2009, but no Americans competed in the series between 2003 and 2007. 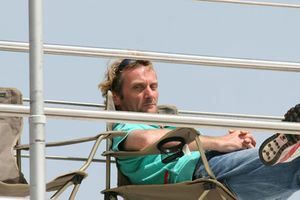 British rider Carl Fogarty has the record of being the most successful rider in the championship's history, winning the championship 4 times, and amassing a total of 59 race wins. Many riders successful in the Superbike World Championship have gone on to MotoGP, such as 2002 champion Colin Edwards, 2007 champion James Toseland, and 2005 runner-up Chris Vermeulen. The championship has seen several former MotoGP riders move to it, usually after failing to earn competitive rides. The 2008 field includes five former MotoGP winners: Max Biaggi, Carlos Checa and Makoto Tamada all raced exclusively in MotoGP before joining SBK, while Troy Bayliss, Noriyuki Haga, and Régis Laconi had alternating spells in both. Superbike racing motorcycles are derived from standard production models. In the past, however, manufacturers took advantage of loopholes in the rules to create "homologation specials" — motorcycles with low production numbers made especially for racing. The times of 1st and 2nd qualifying are combined and the 16 fastest riders qualify for Superpole. The rest receive a grid position based on lap time, starting with 17th. To qualify for the race, riders must record a lap time no longer than 107% of the time recorded by the pole-position rider. Riders go out one by one in reverse order of qualifying position; in Superpole, riders may use a qualifying tyre. If Superpole is declared wet, a 50-minute session takes place for all 16 riders to set timed laps; each rider may complete no more than 12 laps including in and out laps. Race distance must be from a minimum of 90 km to a maximum of 110 km. For the Manufacturers' Championship, only the highest finishing motorcycle by a particular manufacturer is awarded the points for that position, as in MotoGP and most other forms of motorcycle racing. To be eligible for World Supersport, a motorcycle must have a four stroke engine of between 400 and 600cc for four cylinder machines, and between 600 and 750 cc for twins and must satisfy the FIM homologation requirements. World Supersport regulations are much tighter than in World Superbikes. The chassis of a supersport machine must remain largely as standard, while engine tuning is possible but tightly regulated. As in world superbike a control tyre is used, although supersport regulations dictate that the tyres must be road legal and therefore slicks are not allowed. A World Supersport race takes place at every World Superbike round. The FIM Superstock 1000 Cup is a support class to the Superbike World Championship at the European rounds. Motorcycles with the same displacement as superbikes can run in superstock 1000 (though 1200 cc twins were allowed for 2007). Superstock rules are much more restrictive and most components on the bike remain stock. The bikes run on Grooved Pirelli tyres. The Superstock 1000 championship is open to riders up to 24 years of age. The European Superstock 600 Championship it is a support class to the Superbike World Championship at the European rounds. The championship uses 600 cc production motorcycles and is reserved for riders between 15 and 20 years of age. Same rules as Superstock 1000 apply. As the World Superbike Championship has grown in popularity over the years, video games have been developed to incorporate its growing fan base. Originally EA Sports held the licence to produce SBK videos games until 2001 where they just stopped making games. It wasn't until 2007 that SBK was reborn as a video game thanks to Italian developer Black Bean Games. Black Bean has realised 3 games to date with SBK-X set to be the next installment of the series. ↑ Sentul bites the dust.. Retrieved on 2008-03-08. This page was last edited on 28 November 2010, at 02:55.